Whether you’re a freelancer, or just looking for a change of workspace, Mumbai is brimming with cafes that you can work out of. Though not all are conducive to our productivity (looking at you, loud music!) or some don’t let you use their free Wifi with just a cup of coffee. To filter these out, we’ve rounded up our favourite work-friendly cafes in the city. Happy working y’all! This French-inspired café in Colaba is not only beautiful but also a good change for when you’re looking to work out of an unconventional space. It’s usually not that packed, so you can grab your corner and start working. Most of the tables have charging points, and the staff doesn’t really bother you much. Also, with acoustic covers playing in the background, we’ve always managed to get the most productive work done here. Birdsong Café in Bandra is a great place for breakfast meetings, brainstorming sessions or that blog you’ve been working on. The café is quite spread out, with charging points next to almost every table. In fact, they have a communal table where people often seat themselves and work. The Wifi on most days is fast, and you don’t get harassed for ordering one cup of coffee or a glass of smoothie. 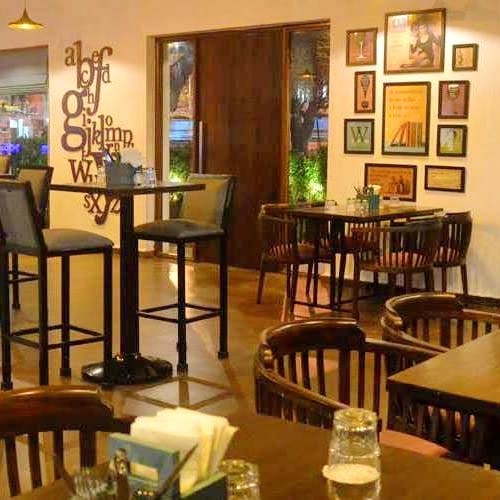 The hidden café in Pali Hill offers two basic things for a productive session – peaceful ambience and fast Wifi. If you’re looking to work out of a space – head here since it is quite a popular place to work out of. You can always go for their in-house bagels, salads, or choose from their special East Indian options. You can either choose to sit outside or park yourself inside. The place is also pet-friendly, FYI. A classic filling English breakfast and a coffee with Wifi thrown in for good measure is what working out of Bombay Coffee House feels like. It’s a great place for work meetings and interviews in case you'd want to schedule one. A universal café to work out from, this list probably would’ve been incomplete without including Starbucks. Most of the outlets across the city have all-day free Wifi, and plug points near the tables. We especially love Starbucks Colaba (behind the Taj Mahal Hotel in Colaba). This Parsi cafe in Ballard Estate is delight to work out of. The dishes on the menu are actually quite budget-friendly, especially the breakfast items. They don’t have plug points next to every table, but you can easily seat yourself next to the nearest point. Cafe Zoe in Todi Mills gets plenty of natural light, making for a rather nice space to work out of. One of the few cafes that opens as early as 7.30 AM which is perfect for getting your early breakfast, and then getting onto work right on. Though do keep in mind, post noon they slightly amp up the music and it gets lively. Apart from that, you’ll often people sitting here and working on their laptops. Definitely one of the most underrated cafes in Mumbai, Mockingbird Cafe Bar in Churchgate is perfect for when you’re looking to perch yourself inside a cozy cafe. With literary puns, literature book-inspired dishes on the menu, and a Wifi to work with, it makes for a fitting cafe for freelancers, and work meetings alike. Tucked away in one of Fort's many bylanes, this cafe has a local vibe and stellar coffee! There's complimentary WiFi and it's quite usual to see creatives hosting meetings, interviews or settling in for a writing sesh. Afternoons are relaxed and the staff is friendly too - they don't hassle you to make a move and pretty much leave you to your work. What to order: Any of their coffees made with their in-house coffee blend are awesome - the classic cold coffee is perfect as a refresher, priced at INR 175 and available with dairy-free milk too. If you're hungry, opt for the KGC Club at INR 350. Located off Carter Road in a narrow lane, The Yoga House is a peaceful retreat that's perfect if you're looking for a quiet corner to get some work done. The multi-level cafe takes up most of the two-storey house, and you can opt to sit at a table or perch on a cozy cushion on the floor. There's a whole host of holistic and healthy juices, salads and more to keep you energised as you work. What to order: We liked the healthy poha with sprouts at INR 195 and the Burmese Curry With Red Rice Noodles at INR 330.